The Delta 19922-SSSD-DST Ashton is an amazing product that comes with the integrated handle as well as easy to pull down spray. This kitchen faucet is one of the top product on the market due to its excellent quality and super easy usage. You will love this kitchen faucet for the comfort and ease. As with most of the Delta line of kitchen and bathroom faucets, the Ashton proudly sports DIAMOND Seal Technology as well as the ever popular MagnaTite Docking mechanism for the detachable spray wand. You don’t have to worry about any leakage with this faucet. Thanks to the amazing stainless steel exteriors that add to the delight of owning an Ashton. Delta’s exclusive TouchClean, MagnaTite, and DIAMOND Seal technologies are the icing on the cake with this faucet as well as other Delta faucets. They all help make usage of the faucet very comfortable, smooth, and functional. This kitchen faucet comes to some amazing features and built quality. Let’s find out more on those in the review. I was surprise to see how the MagnaTite Docking system removes their doubts about the spray wand coming loose over the years. They say it’s a nifty feature that goes extremely well with the detachable spray wand. Let us find out in-depth information on the features of Delta 19922-SSSD-DST Kitchen Faucet in this section. his property of the product makes it as valuable as diamonds. Delta 19922-SSSD-DST Ashton can last for more than 5 million uses. This is long lasting far better as based from the other options of kitchen faucet in the market. As with Delta’s line of teapot-inspired high-arc stainless steel spouted kitchen faucets, Ashton possesses the very same principle for function and form. The ample height of the spout lets you wash large kitchen utensils such as trays and pots with little difficulty. You’ll find that the swivel angle completely allows access to any circumferential point of your kitchen sink so cleaning up after yourself becomes greatly easier. Most contenders for the best kitchen faucet admittedly have dual-option sprays for further flexibility. The Ashton is not deficient in this feature and it efficiently delivers a steady flow of water from the wand as well as an even spray with two options for water pressure to deliver the conservative rate of 1.5 gallons per minute (gpm) or the standard 2.0 gpm, both features having separate buttons on the nozzle for easy control. At the tip of the nozzle are rubber nubbins that employ the TouchClean system of the Delta where you can easily wipe off calcium and lime residue with a touch of a finger. The Ashton kitchen faucet from Delta utilizes the same concept of a detachable spray wand. It allows the faucet reaching pull and clean the underside of large pots. It also clean the corners of your sink. The Ashton is equipped with the MagnaTite Docking system. The system utilizes installed magnets into the spout for an easy docking of the spray wand after pull-out use. This magnet system ensures the locking mechanism stays consistently secure and that the spray wand does not dangle loosely after multiple use. This Delta kitchen faucet is fitted with a DIAMOND Seal Technology valve that not only keeps it durable for at least 5 million uses, but it also keeps the flow of water from touching the metal innards of the faucet. This second function keeps away contamination from the metallic parts of the faucet and leaves you without that nasty steel taste in your mouth. Now that the entire information concerning Delta 19922-SSSD-DST Ashton has been revealed, one should like it. Also, it is obvious that this kitchen faucet is one of the best for you. The elements or features you are looking for in this kind of product are present. Though the price of Delta 19922-SSSD-DST Ashton is slightly high, comparing the other kitchen faucet models out there, this is still acceptable if you will look closer to its features. In fact, this kitchen faucet is recommended by many home owners who have tried it already. In conclusion, the Delta Ashton Single Handle Pull Down Kitchen Faucet as well as the accompanying soap dispenser is a highly recommended product that’s earned a largely positive 4.6 stars on Amazon. 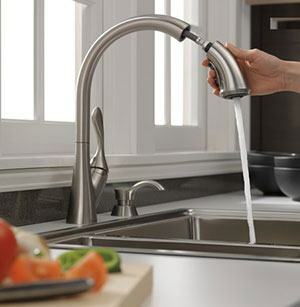 At ~$225, it’s a big attraction to those looking for the best kitchen faucet to fit their needs. Our experts have experimented Delta 19922-SSSD-DST Kitchen Faucet Review and provides information on Performance, Built Quality, Feature, Ease of Use and Design.